Modify the planning list by displaying different fields. By default, the Info and Name fields are displayed as columns when you open planning for the first time. 1. 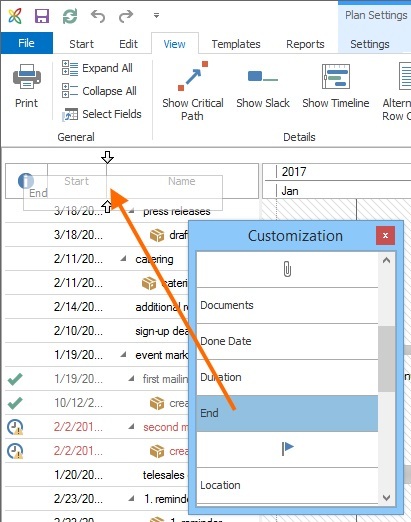 When you open a project plan, right-click into the planning list to open the context menu and click on Select Fields. Or open the tab View and click on Select Fields in the ribbon. 2. The window Customization with the available columns opens. Drag the fields from the window into the planning list. 3. Rearrange the columns by dragging the fields to another position. 4. If you want to remove a column from the planning list, open the context menu first and click on Select Fields to open the window Customization again. Then drag the field you want to remove from the planning list into the window. 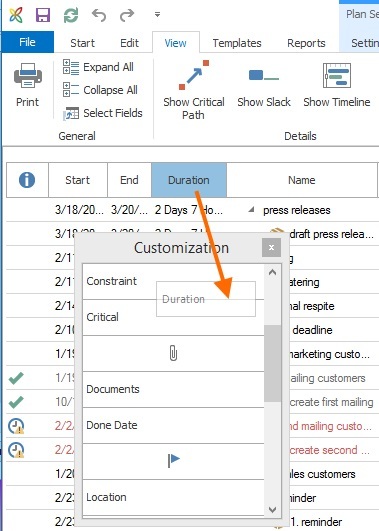 NOTE InLoox will remember your customized planning list and display the selected columns in the same order once you create another project plan. Sie können für die Planungsliste auch eigene Felder definieren, die Sie dann über das Seitenpanel nutzen können. Damit Sie eigene Felder erstellen können, benötigen Sie Administratorrechte. Mehr dazu erfahren Sie unter Optionen. Add columns to the planning list | InLoox 10 • Copyright 1999-2019 © InLoox, Inc. All rights reserved.